My preschooler loves storytelling. He creates stories with his cars, his Legos, as we’re driving, with stickers, pretty much all the time! 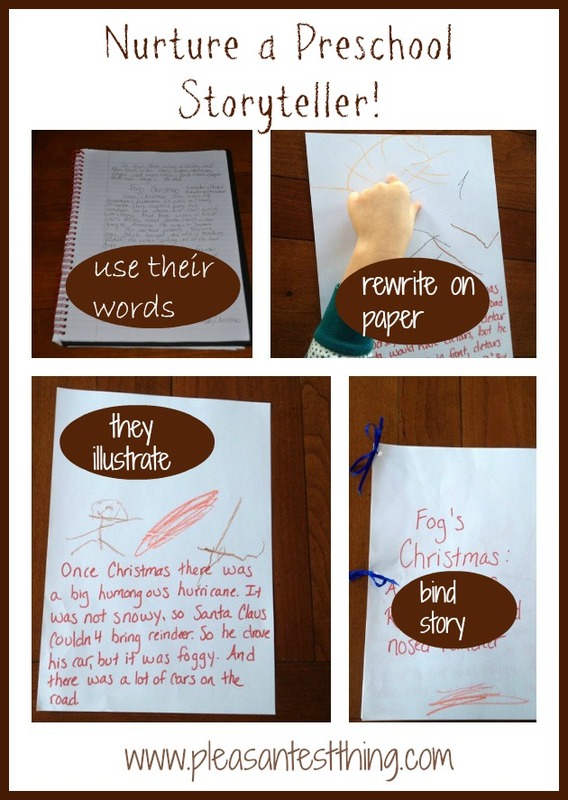 Even though preschoolers can’t write well enough to create their own books, there are so many ways you can encourage preschooler storytelling. 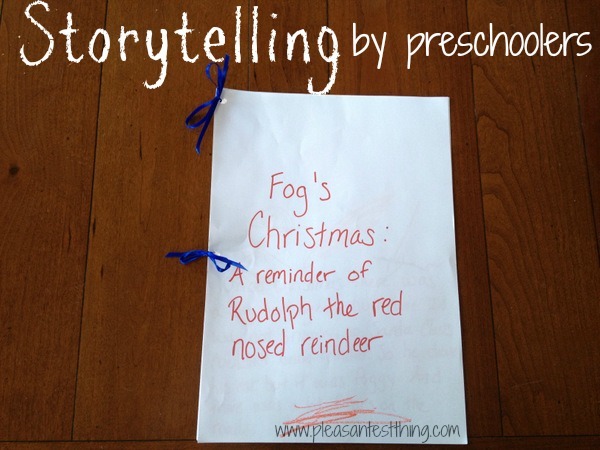 One of our favorite ways to encourage preschooler storytelling is to document my son’s stories. It’s very easy: I simply wrote down his story as he told it. Reinforcing the value of his words and his creative process. As he sees me capture his tales on paper, his eyes light up with pride. Showing him that the words he says are represented by words, which then create a story. That might sound obvious, but I believe reinforcing the concept that his spoken words can be represented on the page is an important literacy connection. He dictates a story, and I frantically jot it down. I write his words down precisely. I rewrite the words onto card stock or construction paper (more legibly!). He illustrates the story. Usually with crayons, markers, and/or stickers. I punch holes in the paper and tie it together with ribbon. (Note: It would be best if I remembered to punch the holes before the story is written/illustrated, so that I’m not punching holes in the finished product. I almost always forget to do this, however). The key to this activity is to keep the story just as he tells it- with all his adorable language quirks, modified words, and incorrect grammar. We read so many stories together, I am confident his grammar/word choice will naturally progress. His stories remain his stories, as he tells them. I also love the finished product- they are great memories. If I could bear to let go of any, the books would make great grandparent presents! Especially when read to them by the author! For more storytelling ideas, stop by my Pinterest storytelling board!